2. Frequency Displays the current frequency. 3. Preset Displays current preset number  ~. 4. 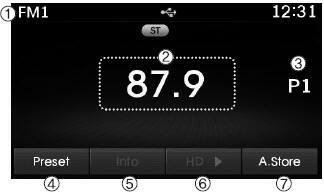 Preset Display Displays preset buttons. 5. Info Displays broadcast information. 6. 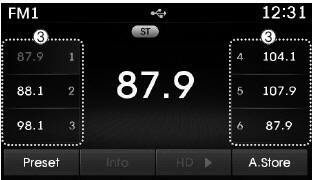 A.store Automatically saves frequencies with superior reception to Preset buttons. If [Mode Pop up] is turned on within [Display], then pressing the key will display the Radio Pop-up Mode screen. Turn the TUNE knob to move the focus. Press the knob to select. Press the key to play the previous/next frequency. Turn the TUNE knob to select the desired frequency. 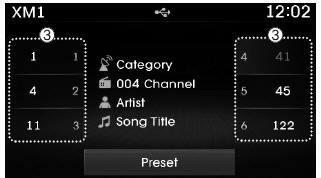 Press the button to display the broadcast information for the frequency saved to each button. While listening to a frequency you want to save as a preset, press and hold one of the ~ preset buttons (over 0.8 seconds) to save the current frequency to the selected preset. Press the button to automatically save receivable frequencies to Preset buttons. While Auto Store is operating, pressing the [Cancel] button again will cancel Auto Store and restore the previous frequency. Press the key to preview frequencies with superior reception for 5 seconds each. Press and hold the key (over 0.8 seconds) to preview presets for 5 seconds each. Once scan is complete, the previous frequency will be restored. While Scan is operating, pressing the key will cancel the scan operation. 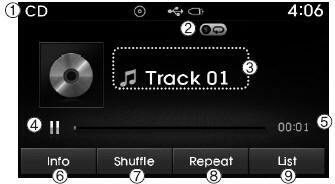 Pressing the key will change the operating mode in order of CD➟USB(iPod®)➟AUX➟My Music ➟ BT Audio. 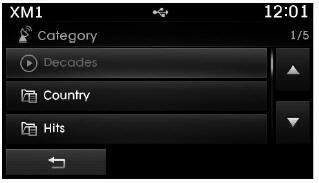 If [Mode Pop up] is turned on within [Display], then pressing the key will display the Media Pop-up Mode screen. The media mode pop up screen can be displayed only when there are two or more media modes turned on. 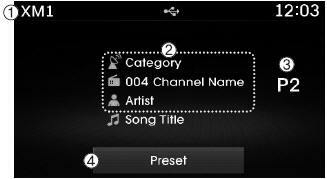 When a Bluetooth® Wireless Technology, iPod®, USB, or AUX device is connected or a CD is inserted, the corresponding mode icon will be displayed. Pressing the key before the track has been playing for 1 seconds will start the previous track. 7. Info Shows detailed information about the current file. Connect the USB device after turning on the engine. 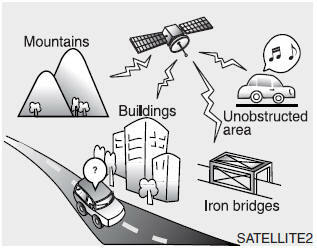 The USB device may become damaged if it is already connected when the ignition is turned on.The USB device may not operate properly if the car ignition is turned on or off with the USB device connected. Heed caution to static electricity when connecting/disconnecting USB devices. Encoded MP3 Players will not be recognized when connected as an external device. When connecting an external USB device, the device may not properly recognize the USB is in some states. Only products formatted with byte/sectors under 64Kbyte will be recognized. This device recognizes USB devices formatted in FAT 12/16/32 file formats. This device does not recognize files in NTFS file format. Some USB devices may not be supported due to compatibility issues. Avoid contact between the USB connector with bodily parts or foreign objects. Repeated connecting/disconnecting of USB devices within short periods of time may result in product malfunction. A strange noise may occur when disconnecting the USB. Make sure to connect/disconnect external USB devices with the audio power turned off. The amount of time required to recognize the USB device may differ depending on the type, size or file formats stored in the USB. Such differences in time are not indications of malfunctions. 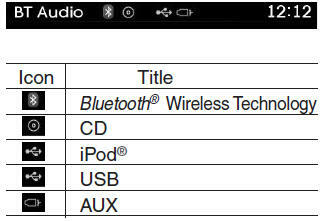 The device only supports USB devices used to play music files. USB images and videos are not supported. Do not use the USB I/F to charge batteries or USB accessories that generate heat. Such acts may lead to worsened performance or damage to the device. The device may not recognize the USB device if separately purchased USB hubs and extension cables are being used. Connect the USB directly with the multimedia terminal of the vehicle. 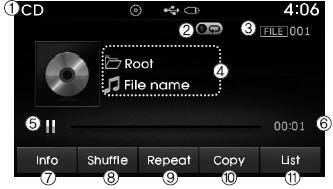 When using mass storage USB devices with separate logical drives, only files saved to the root drive can be played. Files may not properly operate if application programs are installed to the USBs. The device may not operate normally if MP3 Players, cellular phones, digital cameras, or other electronic devices (USB devices not recognized as portable disk drives) are connected with the device. Charging through the USB may not work for some mobile devices. The device may not support normal operation when using formats such as HDD Type, CF, or SD Memory. USB memory sticks used by connecting an Adaptor (SD Type or CF Type) may not be properly recognized. Avoid use of USB memory products that can also be used as key chains or mobile phone accessories. Use of such products may cause damage to the USB jack. 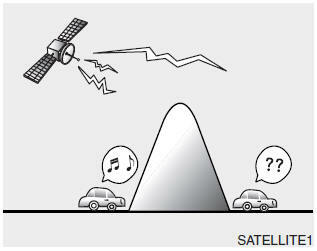 Connecting an MP3 device or phone through various channels, such as AUX/BT or Audio/ USB mode may result in pop noises or abnormal operation.